We're sorry, but space Amphitheatre-style workshop room with startup vibe - betahaus Berlin Kreuzberg is no longer available. Drinks Flatrate; Bio_Tee, Fairtrade Coffee, Water - Softdrinks, like Fritz Cola, Club Mate etc. 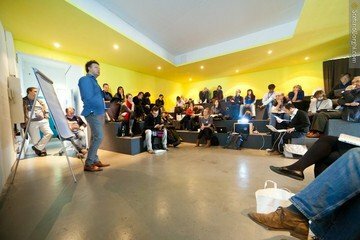 This location is an excellent seminar or workshop venue in in the heart Berlin-Kreuzberg. The Arena - constructed like an amphitheater - can be rented out for various events. The 60 square meter room has a capacity for 40 people seated on the benches that are installed in the walls of the room. The workshop space is a 1 minute wak from U-Bahn Moritzplatz which has good connections to the rest of city. The price advertised includes projector and screen. Situated in a buzzing coworking house in the throbbing district of Kreuzberg, the location has be encouraging creative collaboration, networking events and coworking benefits since its inception in 2009. The Spacebase team recently had our strategy workshop here. It’s the perfect place to get infected by creativity and tap into the world of digital strategy and e-commerce. We loved the amphitheatre-style layout which allows staggered seating for a large group, all of which can see the screen. The plug sockets on the seating is also a nice touch as they provide easy access for laptop and phone chargers. Die Location war super und alles ist gut gelaufen.